The rights of the future? The future is among us and it has names and faces: Vandana Shiva (56), the Indian activist against GM crops, Australian environmentalist Tim Flannery (53), and Tadatoshi Akiba (67), the mayor of Hiroshima. They are some of the councillors of the World Future Council (WFC), an organisation that claims to speak on behalf of future generations, although with voices that sound quite familiar. The WFC recently brought together some 120 international legal experts for a conference in Montreal. The topic: Crimes against Future Generations. While politicians like talking about sustainability and inter-generational equity, the WFC aims to take its concerns to a new level and it campaigns for protecting the rights of future generations within the legal system. It wants to see alleged crimes against future generations punishable by international criminal law. Corporate executives or heavy energy users could soon come under the purview of laws usually reserved for dictators and war criminals. If an eminent judge and lawyer like Weeramantry so passionately defends the rights of future generations that he labels everyone who disagrees with his proposition ‘heartless,’ then the moral stakes in the debate could hardly be higher. On the other hand, passion and emotions have their place in life but it would be foolish to make them the guiding principles of law. Is there a basis for claims that future generations have rights? Can these rights be spelt out? Are they compatible with our usual understanding of justice? These questions deserve logical answers. Making them moral issues is not a substitute for rational debate. It is true that the life of the law is not always ruled by logic, as Judge Oliver Wendell Holmes once put it. Yet if we care about the consistency of the law, we should not brush aside such considerations for the logical consistency of the law. As it turns out, the quest for future generations’ rights may not be reconcilable with a legal system free of internal logical contradictions. Furthermore, the rights of future generations may clash with the right of the present generation to live a free life under the rule of law. Above all, as long as the future is uncertain the rights of future generations remain difficult to define. Who is the voice of the future? The first problem with future generations is so obvious that it sounds like a truism: They do not yet exist. While organisations like the WFC and its councillors claim to be ‘the voice of future generations,’ the truth is that these future generations do not and cannot have a voice. In fact, they do not have anything: no voices, no ambitions, no achievements, no preferences, no desires, no habits. Claiming that non-existing persons possess anything is so evidently absurd that it is hard to understand how the notion of future generations’ rights could ever be taken seriously. The ‘rights’ of future generations can only ever be a fiction that is administered by the present generation. Mysticism aside, legal capacity is obviously linked to the present and the existing. It is not conceivable how either past or future generations can make their alleged rights heard today. The dead and the unborn hardly ever appear in election campaigns, courtrooms, or at political rallies. Decisions can only be made in the present, by the present. If this is so, and it should be clear that it cannot conceivably be otherwise, then the ‘rights’ of future generations can only ever be a fiction that is administered by the present generation. Someone living today will have to act as caretaker for what are deemed to be the interests of future generations. Such an arrangement with a present-generation caretaker of future generations’ interests is problematic. The first question is who could claim to be this caretaker? The person of the caretaker matters because it determines the way in which future generations’ rights are interpreted. For example, if environmentalists like Shiva and Flannery were in charge of exercising the rights of future generations, they would necessarily do so in accordance with their own present-day ideological predispositions and their own current knowledge. This means that they would put less emphasis on economic growth or increasing private consumption and instead focus on other goals such as limiting energy use and preserving biodiversity. But what if we chose a different caretaker, say an economist whose goal was to increase wealth and productivity? Surely, this would have an effect on the way that the rights of future generations would be exercised. Again, it would be the economist’s own present-day predispositions that would determine the interpretation of the rights of future generations. It does not matter whose interpretation is correct, but there can be no doubt that the person in charge of exercising the rights of future generations matters greatly and influences the way in which these rights will be interpreted. It is a matter of preferences, priorities and predispositions. In a way, this is a problem for every relationship between a principal and his agent. The added difficulty here is, of course, that the principal has no way of choosing his agent, nor could he control his actions. The principal and his agent may in fact never meet. It is a strange kind of arrangement between the future and its self-appointed representatives. Those claiming to fight for future generations have no way of proving that they are actually working in any other person’s interests than their own. By claiming to speak for future generations, they are only trying to add additional legitimacy to the political agendas that they were pursuing anyway. The voice of the future turns out to come from a ventriloquist of the present. What can we know about the future anyway? Going through human history, it is astonishing how many forecasts have turned out not just inaccurate but utterly wrong. Perhaps even more surprisingly, all these forecasting disasters haven’t cured us of the false belief in our ability to accurately predict the future. The basic problem of forecasting the future is our tendency to imagine the future as a linear continuation of the present. When looking at current trends, we often believe that they will go on indefinitely and that this will create problems. The classic example is that of a letter writer to the London Times in 1894 who was worried that with London’s ever-increasing traffic (most of it horse-drawn), the city’s streets would be covered by 10 feet of horse manure within decades. It did not occur to him that Londoners would find a way of solving this problem; nor did he foresee that the invention of the internal combustion engine would reduce the need for horse-drawn carriages. We should not feel smug at the naiveté of this worried Londoner of the 1890s. His way of thinking about the future is not too dissimilar to the pessimists of our time. For example, when environmentalists develop their apocalyptic visions of rising sea levels, they are making the same mistake. They believe that rising sea levels would inevitably lead to disaster—as if people would passively stand at a beach and watch the waters rise until they drown. In fact, sea levels have been rising for many centuries but nothing of the kind has happened. People have reacted intelligently to changes in sea levels. In the Netherlands, they built dykes to protect the country from rising tides. The basic problem of forecasting the future is our tendency to imagine the future as a linear continuation of the present. Dwindling energy reserves are another case of our inability to imagine a future that is not just a continuation of present trends. Again, looking at historical examples we can see how pessimism about our ability to meet future energy needs has a long tradition. In 1865, British economist William Stanley Jevons published a book titled The Coal Question. He predicted that Britain would soon run out of coal and lead to economic decline. Although his prediction was correct that British coal production could not be sustained at high levels forever, coal was effectively replaced by other forms of energy and Britain continued to grow despite the decline of its mining industry. A century after Jevons published The Coal Question, the Club of Rome predicted a similar energy crisis in its famous The Limits to Growth report. Yet again, the horror scenarios of a world running out of energy sources did not turn out to be true. Today, theories of peak oil are once again predicting an energy problem on the horizon. The future seldom turns out as we imagine it. The future is not a continuation of the present. What was significant yesterday may be irrelevant today and forgotten tomorrow. Uranium was first used as a colouring agent in glassmaking by the Romans but the chemical element itself was discovered only in 1789. That it was a radioactive element was found out much later in the late nineteenth century, and its use for power generation began as late as 1951. As if history were repeating itself, there are already people warning that our uranium reserves will run out. Whether this forecast will materialise depends on too many factors that are almost impossible to predict. Whether it is horse manure, coal, oil, or uranium, there is a lesson in each of these examples: Forecasting the problems, resources, demands, and scarcities of the future is a complex task. What is certain is that by extrapolating from the present situation, we are unlikely to correctly predict what the future will hold. We have no way of knowing how people will generate power 200 years from now. We do not know how and how much they will travel, where they will live, how they will live, what jobs they will do, or how they will communicate. It is fascinating to speculate on these things, but it would not necessarily get us anywhere closer to future reality. We may believe that we have the necessary knowledge to forecast these issues but so did all the other experts of the past who came up with grossly inaccurate predictions. The really important innovations that shape our lives today have hardly appeared on the experts’ radar: Who would have thought that Google would become the dominant player on the Internet? Who predicted the success of the World Wide Web anyway? Life is not a steady state. It is a never-ending series of surprises. New technologies often come as a surprise. It is even stranger that when they do appear and become important, we may not anticipate their impact correctly. The invention of the radio saw experts declare the end of the newspaper. Yet the newspaper did survive the new competition. When television was invented, the pundits said it would kill the radio. Sadly for the experts, the newspaper, radio and television still survive—along with a host of new media. It is so difficult to predict the occurrence and likely impact of new technologies because life is a chaotic and evolutionary process. Life is not a steady state. It is a never-ending series of surprises. it is possible it would have tried to find alternative energies such as oil. Going back even further, a World Future Council in the year 1800 would have had different priorities. If Thomas Malthus had been a councillor, he would have pressed to stop population growth. After all, he had predicted a food crisis in his book The Principles of Population. In any case, the concerns of the past would have failed to adequately address the real problems of their respective futures. What are the chances of a council of wise men and women in the year 2009 finding answers to the supposed needs of the future? Surely, their methods of predicting the future would be more elaborate than the simple mathematics of Malthus or Jevons. But despite the fact that the models used today have become more complicated, there is no escaping the fact that they remain models. The scenarios used by the Intergovernmental Panel on Climate Change, for example, are based on extremely complex calculations. Yet this does not necessarily make them more accurate. None of the computer models used by climate scientists correctly predicted that temperatures over the past decade would actually fall despite rising carbon dioxide emissions. If they failed to predict the last 10 years, why should we believe that they can predict the next 100 years? With all these uncertainties about the future, the rights of future generations become a nebulous concept. Even if we all agreed on the best way to make the future a better place, there is still the danger that we would be focusing our efforts on the wrong issues. Many people believe that man-made climate change is the biggest threat for the future of the planet and the survival of humankind. Maybe they are right, in which case acting on behalf of the future would direct us to all sorts of climate-related policies. But given our human track record of predicting problems, we should not be too sure that these climate change activists are correct—in which case the efforts to stop climate change would be wasteful or even positively damaging. The real interest of future generations would have been to stop worrying about climate change and direct our efforts to other areas. What do we ‘owe’ to the future? According to Antoine de Saint-Exupery, ‘We do not inherit the Earth from our parents, we borrow it from our children.’ It is a nice aphorism although aphorisms should not usually be taken literally. However, it is such thinking that is behind the idea of future generations’ rights. It is thought that we are not only caretakers exercising the future’s rights but that we are only handling possessions that do not actually belong to us. If this argument were true, we should not be allowed to use any resources—these resources are on ‘loan’ from future generations and thus have to be returned to them. A barrel of oil burnt today is a barrel of oil that future generations cannot burn any more. Consequently, any use of resources today would be no better than theft or embezzlement. With all due respect, this is nonsense on stilts. In order to minimise depletion you have to stop extraction. Simply managing it would not be enough. It is a fact that non-renewable resources used today cannot be used again in the future. Coal, natural gas, uranium, oil: when they are gone, they are gone. Perhaps people like the drafters of the Earth Charter had something different in mind. Maybe they only wanted to ensure that all present and future generations could use the same amounts of these natural and non-renewable resources. Unfortunately, this would not solve the problem, either. If there were 999 generations after us, then we would have to divide the world’s nonrenewable resources by 1,000 and only consume our 0.1 percent share of the pie. But what if there were going to be 10,000 or 100,000 generations after us? Who knows? Given that planet Earth is thought to last for another 3 to 5 billion years, it is at least possible that there will be many, many more generations to follow our own. If we were to leave them their share of the non-renewable resources then, in effect, we would have to stop consuming them right now. The very idea that there are some resources that we have borrowed from the future leads us into a logical dead-end. We would have to stop using resources and drastically cut both our energy consumption and economic activity. Whether this ensures a world that future generations would like to inhabit is another matter. The very idea that there are some resources that we have borrowed from the future leads us into a logical dead-end. So what if we did the very opposite of what the environmentalists demand? What if we continued to consume non-renewable resources, tried to maximise our economic growth, and continued adapting to changing circumstances, scarcities and technologies? This is, after all, what humanity (by and large) has been trying to do since the beginning of modern capitalism. If the experiences of the past are anything to go by, then we can expect the world economy to grow and our populations to become wealthier. Of course, there is no guarantee that the economic growth rates of the past will continue into the future. Just like anything else happening in the future, there is uncertainty about our future economic growth as well. Nevertheless, it is not unlikely that global economic growth will continue. We simply have to compare the current level of wealth in developed nations and in poorer countries to see that there are vast potentials for the latter to catch up. This alone could become a main driver of global economic growth. The wealth that future generations will be able to enjoy makes the question of their rights appear in a different light. Where in ethics or legal philosophy has there ever been an obligation by the poor to restrict themselves for the sake of the rich? Why should we make sacrifices today for the benefit of our much richer grandchildren? This is not to argue that we should turn around the argument and call for a wealth transfer from the future to us (say by leaving them with a huge burden of public debt). But it does beg the question what kind of duties we owe to future generations: Do we owe them a specific set of resources? Or do we simply owe them our best efforts to leave them a free and prosperous society in which they can make their own choices? Economists sometimes wonder what Adam Smith would have said about current issues. 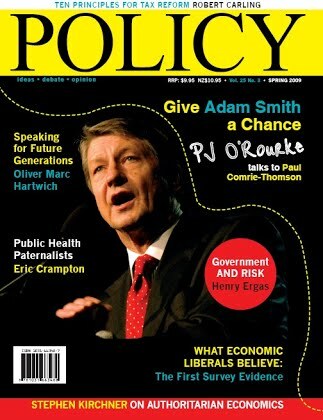 While Smith did not leave us his ideas on the rights of future generations, it is not difficult to guess what he would have thought about them. In a famous passage in the Wealth of Nations, Smith wrote: ‘It is not from the benevolence of the butcher, the brewer, or the baker, that we expect our dinner, but from their regard to their own self-interest.’ Likewise, it is not the benevolence of past generations to which we owe our current wealth. Nor will it be from the benevolence of our own generation that our children and grandchildren will enjoy theirs. In fact, keeping our societies free and democratic would also be the greatest gift we could make to ourselves. Future generations will thank us for such selfishness. 1 World Future Council press release, Crimes against Future Generations Need to Become Taboo (29 May 2009). 2 ‘Building in Iceland? Better Clear it with the Elves First,’ The New York Times (13 July 2005). 4 Speech by Alex Tabarrok to http://www.ted.com (27 April 2009). 5 Wilfred Beckerman, A Poverty of Reason—Sustainable Development and Economic Growth (Oakland, California, 2003), 76.